You can help endangered species by making a donation to the Rare and Endangered Species Preservation Program, the California Sea Otter Fund, and the Native California Wildlife Rehabilitation Fund in the Voluntary Contributions section of your California Income Tax Form. If you itemize deductions, your donation will be tax deductible the following year. If someone else prepares your tax return, please tell him/her that you want to make these contributions. If you use TurboTax and can’t find the California Contributions page, this TurboTax-TY2018_HowToFind-TaxDonationFunds (PDF) document will help you find it. California has renowned biological diversity due in part to its unique geography and geologic history, five major climate types, and sheer size of more than 100 million acres. Our state supports more than 5,000 native plant species and more than 1,000 native animal species. At least one third of the plants and two thirds of the animals are endemic species that occur nowhere else in the world. Unfortunately, many of them have been pushed to the brink of extinction. Their future is in our hands, and your contributions can help save them. Of all these species, more than 300 are designated by the state as rare, threatened or endangered. Loss of habitat, water management conflicts, invasive species, and climate change are the greatest threats to their long-term survival. These plant and animal populations are part of California’s natural ecosystems and our heritage. They need our help to survive and thrive as they did before humans began to change and fragment the natural landscape. Past contributions to the Rare and Endangered Species Preservation Program have supported CDFW scientists’ work to identify and mitigate—where possible—the conditions and activities that threaten these species’ populations. 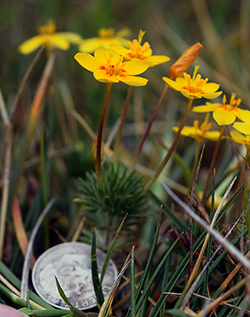 This work has helped protect hundreds of endangered plants and animals in California. Two formerly listed endangered species—the California brown pelican and peregrine falcon—made such a comeback, they were de-listed in 2009. CDFW biologists are currently working with other partners to monitor the status of these two species to help validate their recovered status. By donating whatever you can afford—even if only a few dollars—you will help ensure that critical habitat for endangered species is conserved and enhanced. You will contribute to the protection and scientific management of these plants and animals for the future. Last year (2018), 31,885 Californians contributed to the Rare and Endangered Species Preservation Program. If more people contributed on line 403 it would increase our ability to conserve and monitor imperiled species. Please help us spread the word. The California Sea Otter Fund provides crucial support for the CDFW scientists investigating sea otter mortality and the reasons the population isn’t thriving. California’s southern sea otters (Enhydra lutris nereis) were thought to be extinct from the late 19th century until 1938, when a small population was discovered near Big Sur. Given legal protection, their numbers slowly increased and they were listed as "threatened" under the federal Endangered Species Act in 1977. They are also protected by the federal Marine Mammal Protection Act and have fully protected species status under state law. The sea otter population has increased in fits and starts, and currently hovers around 3,000 individuals. Population growth continues to be limited by a high mortality rate, failure to expand the geographic range, and competition for resources in some areas. Donations to the California Sea Otter Fund support research by CDFW scientists, who have discovered that a substantial proportion of sea otter mortality has been caused by diseases, parasites and toxins. Many of the things that make sea otters sick and kill them in the ocean have been related to human activities on land. The cumulative effects of various types of pollution are contributing to premature deaths of otters that should live longer and produce more pups. Past contributions to the Sea Otter Fund enabled CDFW scientists to research and identify what has been killing otters in their prime reproductive years. If you contribute even a few dollars when you file your state income tax return, you will help make more of this research possible and—we all hope—find ways to help these iconic creatures return to their historic numbers. Last year (2018), 22,731 Californians donated to the California Sea Otter Fund on line 410. Half the money donated to the Sea Otter Fund goes to the State Coastal Conservancy (SCC), where it is used to support research, science, protection projects or programs related to the Federal Sea Otter Recovery Plan or improving the nearshore ocean ecosystem. This includes program activities to reduce sea otter mortality. Information about the SCC program and a summary of projects the SCC has funded (PDF) are available on their website. Thank you for helping California’s native wildlife thrive and enhance the quality of life for everyone.